Russia Today has reported that Iran has released a new stealth suicide UAV designed to attack land and maritime targets. According to RT, the Tasnim news agency reported that the Iran Revolutionary Guards—Iran’s most powerful security and military organisation—had announced the new 'suicide drone' which delivers a payload of explosives. It is reported to be able to fly at low altitudes without detection (two feet above water) and can be flown at a maximum altitude of 3,000 feet for approximately four hours. Back in May, RT reported that Russia was also developing a 'kamikaze' UAV to suppress enemy air defences and provide tactical air support. ISIL or Daesh is also reported to be using small, commercial off the shelf UAVs, such as those manufactured by Chinese company DJI, for artillery spotting in its defence of Mosul. Daesh have also been loading the UAVs with explosive devices. The Air Force Times reported that Republican congressman Duncan Hunter of California recently wrote to Air Force Secretary Deborah Lee James requesting a briefing on current efforts to field counter-unmanned aerial systems technology. Hunter called for the acquisition and development of counter-UAV systems to be expedited. James recently stated that the US Air Force had shot down an Islamic State UAV with an "electronic weapon" according to media reports. In May it was announced that the Defense Department and Dept. 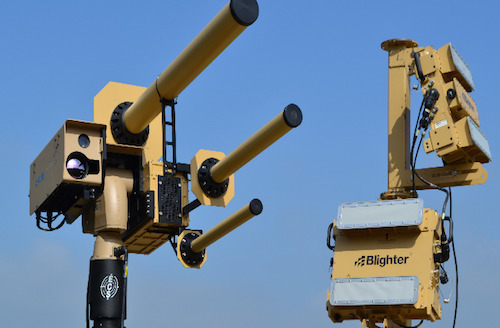 of Homeland Security in the US were committed to buying 100 DroneDefender Systems developed by Batelle, which is a non-kinetic counter-UAV solution that is able to disrupt a UAV 400 metres away by emitting a laser signal that affects the UAV’s remote control and GPS. According to DefenseTech, the US is using various systems to counter the ISIS UAVs, including jamming and small arms fire. In July, the Pentagon asked for $20 million to be invested in counter-drone measures. While a number of counter-UAV solutions available on the market can jam a UAV's GPS or comms signal or forcibly land a drone, none at this stage are able to take control of the rogue UAV and issue commands to it.